Priya and Jesse Wittman spent that past month at A.I.R. Studio doing two things: looking and listening. Priya is a visual artist and Jesse a musician. Their residency has allowed the time and space to explore working together in their two distinct disciplines, beginning a new phase in their relationship. Priya earned her Bachelor of Fine Arts in Painting from the Herron School of Art and Design. Jesse earned his Bachelor of Arts in Jazz Studies from the Jacobs School of Music at Indiana University. Their foundation of formal training gives them a unique approach to their contemporary work, both referencing their past instruction through their work. Priya and Jesse enjoy working with synthetic materials because through them they are able to reference natural objects. 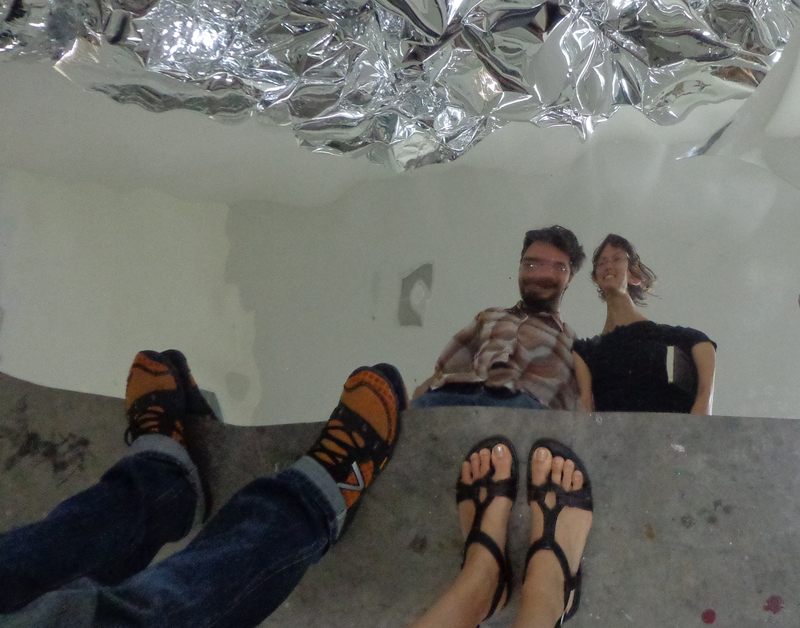 Priya uses two weights of mirror mylar, a material often used in greenhouses for its light reflecting qualities. Her other materials typically come from craft stores like, Hobby Lobby and Michael’s, trying to push the limits of how a material can be viewed and often taking a material out of context by manipulating it beyond recognition. Jesse’s work with digital music started when a friend invited him to create a computer duet, and has evolved since. He works with the program PureData, which can be downloaded from the internet for free, allowing anyone who is interest access to create music without having to write code. Their use of items that are easily obtained helps them to push the boundaries in their work, so that making work can be both experimental and experiential. During their stay Priya and Jesse have been very active. 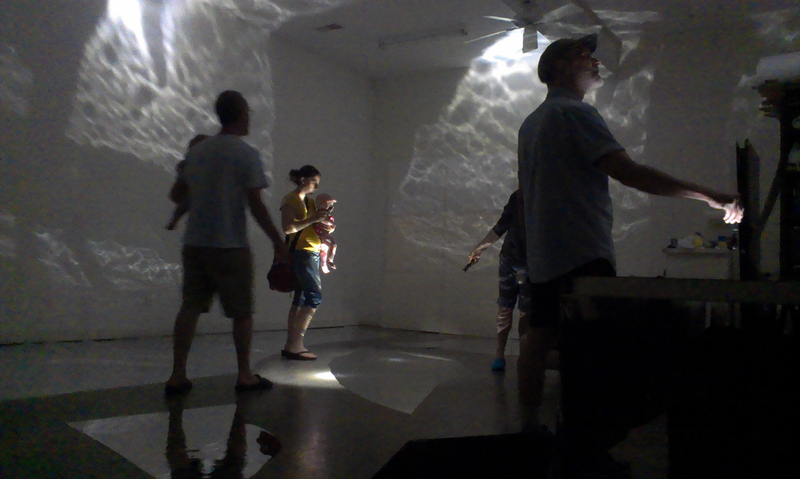 Their first event, “Sojourn”, allowed the viewer to explore an “other world”. “Sojourn”, meaning “a temporary stay” was an temporary installation created in A.I.R. Studio using mylar film, computer generated sound, and lights. Reminiscent of the Northern Lights, the play between the synthetic materials and noises and those of the natural world created an oddly beautiful environment within the studio. With the lights on, the magic qualities of the mylar disappeared, leaving behind a room that looked simple and cheap. Read more about “Sojourn” here. Their second weekend here, Priya was invited to Live on Broadway to lead the visual activity at the “Family Fun Zone”. 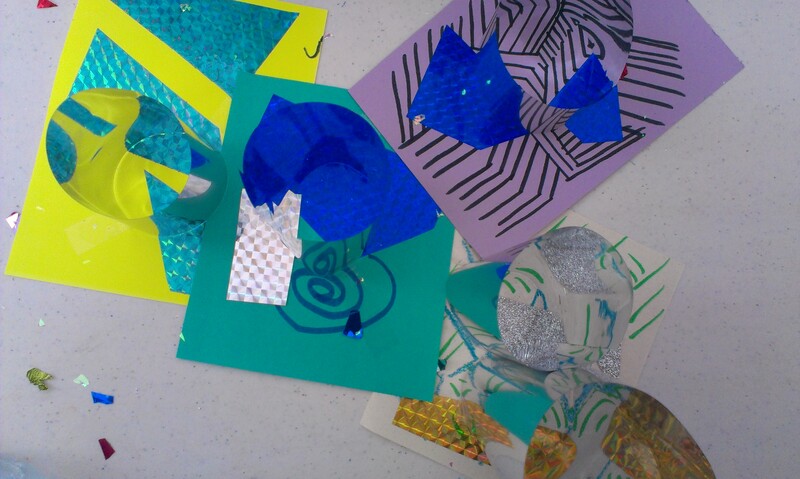 She brought many of her essential materials, including mylar tubes, scrapbooking papers and markers for children to explore and create their own “vortex drawings”. The children were instantly absorbed in making when they discovered the kaleidoscope effect that the mylar tubes had on their drawings. Through their materials they explore how close one can get to kitschy, gaudy and still maintain qualities of that are beautiful and magical. Their final Open Studio was quite different from the first; lights were on, not off, immediately drawing attention to the materials. The mylar film was crinkled and covered the long wall in the studio, pooling onto the floor. 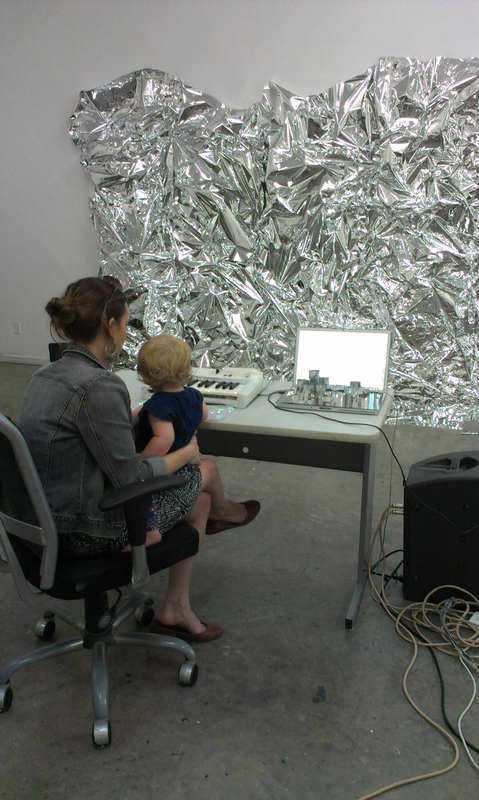 Using a midi keyboard controller and laptop, Jesse constructed a basic instrument allowing participants to manipulate projected sounds through the PureData program. The sound maps were displayed on an adjacent computer, providing a visual outlet showing how the sounds were processed by viewer interaction. Jesse’s attraction to computerized music comes through the unexpected results that arrive through the human contact with the program. The rigidness that is often expected with computerized music can be overcome through this interaction, and the outcomes are often surprising. Nearby, Priya set up a table with materials for participants to construct their own objects. “Into Space” emphasized playful audience interaction and experimentation with sounds and materials, gravitating towards the synthetic and toeing the line between gaudy and beautiful. Priya and Jesse hope the discoveries made during their time at A.I.R. Studio will lead to additional work in non-conventional performances and installations. To read more about their time in Paducah, visit their blog.